Merry Christmas, everyone! It’s that time of the year! Time to remember and celebrate Jesus’ birth, see friends and loved ones, gift giving, travel, and food, food, food. Have you ever noticed that people associate food with just about every holiday, especially Christmas? We have had so many cookies, treats, candies, cakes, and other yummy delicacies this past week at work. My husband and I have come home laden with chocolate treats and caramel corn. It’s crazy. You know, we don’t get treats like this for Fourth of July or even Thanksgiving. It’s just at Christmas. Not to mention the many family gatherings everyone goes to where there is – you guessed it – food. So what’s a healthy girl to do? I don’t try to pretend like I have all the answers, but I can at least tell you what I plan to do. Maybe you can take some of these tips and apply them to your own eating and celebration habits this Holiday Weekend. 1. I plan on keeping my plate 3/4 vegetables and 1/4 meat. Period. I heard about this tip in a parenting magazine, and I tried it out the other week at a wedding reception. I was pleasantly surprised at how well it worked. I have thought in the past that meat = what makes me full. Meat isn’t unhealthy, but it does pack a lot of protein and contains zero fiber. While you need protein, you also need the nutrients of vegetables to make sure your body stays in working order. If your plate contains 3/4 vegetables, you will be consuming the vitamins, minerals, and fiber needed to promote healthy digestion, while still getting the protein you need from the meat. I came away from my “trial plate” as full as can be, thanks to the fiber. 2. Try to cut back on the sweets. I know you hear this a lot, and no one wants to hear it, but it’s necessary, I think. A huge platefull of dessert most likely contains enough calories to substitute a meal, and after the calories you’ve just consumed at your holiday dinner, you don’t need to continue piling on the calories, not to mention the sugar. Small portions of sweets are enough to satisfy your sweet tooth without adding too many unnecessary foodstuffs. 3. Drink lots of water. 80 oz. a day is recommended. Keeping water in your body will keep things moving through your digestive system, giving it less time to sit and have more calories absorbed into your body. Water also helps you feel full, so if you don’t mind skipping to your loo later, you can drink a good bit before dinnertime to ensure you don’t overeat. These are the three tips I’m going to keep in mind as I celebrate the holidays with my family in the coming week. I think, with these tips, you too may have a less guilty Christmas (if you’re prone to that like I have been) knowing that you have done well to try and stay healthy. I think you’ll feel better, too! That time of year when you actually get to see family you haven’t seen the rest of the year. You know, I think we should all try harder to see our families and friends at times other than Thanksgiving and Christmas. Sometimes it seems like we say “Oh, behold! It’s the Holidays! I get to see my family!” I am blessed that I get to see my parents fairly regularly. It’s the other relatives I don’t see too often. My sister, for instance, has been in Spain studying since September. I have missed her tremendously since she has been gone. We got her back on Saturday, though! SF Hubby and I went with my parents, her fiancee and friends, and my aunt and uncle to pick her up in Atlanta. It was a big day for all of us, and we’re very glad she’s home. It’s also that time of year that you have more on your calendar than you can realistically “make happen.” I think that’s what has happened to us. We have been very busy – sometimes with planned activities, and, well, you know, the unplanned stuff that comes up – so I have had less time home with my two boys than we are used to. For that reason, the blog took a passenger seat for a time. Surprisingly, thinks have slowed down enough that I can pick back up on my blogging. I have not been blogging, but I also have not given up on living healthy. I still get my fiber, and I try my hardest to make my “cheat meals” few and far between. I am trying to make a game plan for the upcoming two weeks as far as my eating goes. I plan on consuming most of my fiber at home and at work, and I am prepared to eat a few challenging meals (as in it will be a challenge to make the meal healthy). With family in town, and it being Christmas, often I don’t know what’s on the menu until I sit down at the table. I have a few strategies that I am hoping *fingers crossed* work for my holiday eating. Maybe these tips will help you out, too. I have heard that if your plate is 3/4 vegetables, you will already be eating healthier than the average American this Christmas. Let 1/4 of the plate be meat with no gravy, and the rest be vegetables. For heavy hors d’oeuvres, I will try to make my plate mostly vegetables and crackers, with one or two savory treats. Restaurants really aren’t too much of a challenge for me. I have learned how to look for healthy items on the menu, so this doesn’t present a problem for me. Hopefully, with these tips in mind, I will survive this year’s Christmas eating unscathed. I also would like to let you know that I am going to be blogging book reviews again. I had a blast when I did this last year, and I am looking forward to starting back up. The address for my new book review blog is http://southernfiberreads.wordpress.com. I hope you will check it out! I am networked with several authors and book reviewers, so I am in the process of obtaining new books for me to read and review. In the meantime, I am transferring my old reviews onto the new blog, so check back often for updates! I hope you all have a very Merry Christmas this year, and keep in mind that because Christ Jesus was born and gave us the greatest gift ever given, we are able to join with those we love and give of ourselves to them. Hello all! It’s been about a week and a half since I have blogged. I’m sorry about that – life has been hectic with the holidays coming up! I want to share with you three very delicious meals I have eaten recently while out with my husband. You know, it often seems next to impossible to eat healthy when you eat out. Most restaurants load you with calories and carbs – but I have noticed that, if you look hard enough, you can find healthy AND tasty choices when you’re not eating at your own table. Take this meal for instance. At this particular restaurant, I was uncertain as to what to order. They serve burgers, pizza with lots of cheese, and chicken that comes with, like, ten stuff piled on top. Not what I wanted. 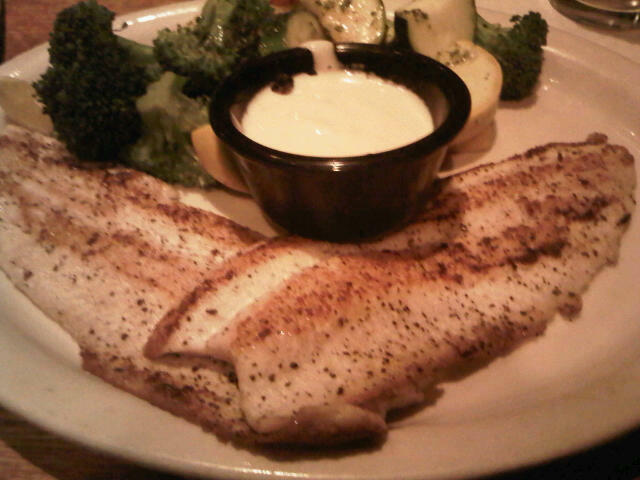 Then I noticed Rainbow Trout on the menu. It is listed as seasoned and deep fried, but upon closer observation I saw in teeeny tiiiny letters May be served grilled or blackened upon request. Aha! Something I can eat!!! This came served with a reumelade that I barely used. The side I chose was steamed veggies, which were wonderful – zucchini, squash, carrots, and broccoli, that had been very lightly drizzled with herb infused olive oil. Le sigh, happiness. Here’s my breakfast on Sunday morning! We were up way early since the clocks got set back, and decided to eat breakfast before church. We ended up at Cracker Barrel. Again, not known for being health conscious. I was delighted when I saw they have an oatmeal breakfast! I’m sure it’s always been on the menu, but I have a long history of ordering their Old Timers’ Breakfast, so I had never seen this. 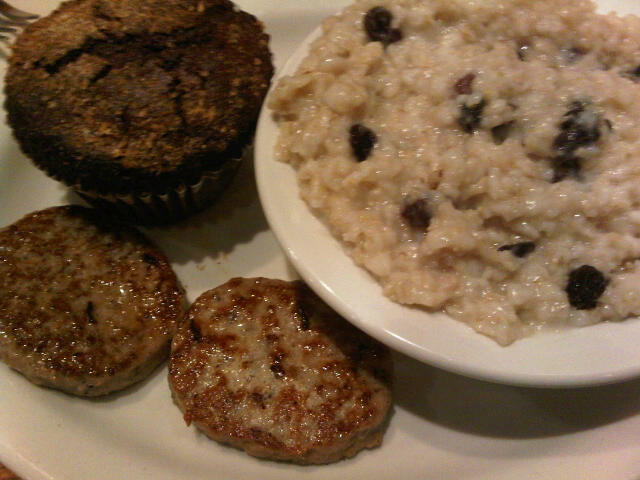 A heaping serving of oats that I added raisins to, an apple bran muffin, and two turkey sausages. I was so stuffed I could only eat a fourth of the muffin. Granted, the muffin was huge, but still. I was still full at lunchtime. Yummers! 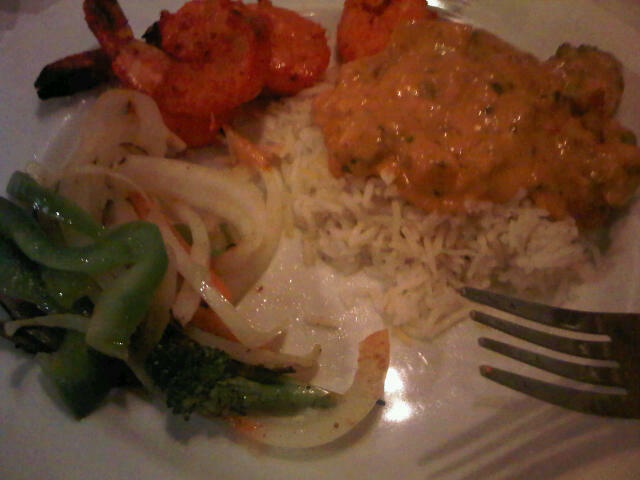 Indian food!!! I had never eaten real, true Indian, but it’s one of those foods I’ve always wanted to try. Scott and I are seriously into Bollywood films (you should check them out) so there was a sense of novelty to eating Indian for us as well. We ordered a dinner for two that had ten items I can’t recall on it, but the tandoori was wonderful! This was served with a lot of basmati rice, which I think has become my new favorite rice. Very full flavor, and I like that it’s not sticky. It’s easier to mix with the other meats and veggies that way. And Indians love vegetables – we ate a lot of veggies that night. Scott and I both foresee many more Indian meals in our future. Next time you’re eating out, look for ways you can eat healthier. Many restaurants are starting to offer healthy alternatives, but be careful – make sure their healthy is really healthy. Healthy does not equal fried or loaded in sauce! In time, you will learn what restaurants serve healthy options and which ones really don’t. Happy eating! Many of you are aware of the Grocery Store Relay I attend every other Saturday. My husband lovingly reminds me that the correct term for the event is “Sidewalk Sale.” He has never been. Row after row of boxes, with people crowded around 3 to 4 people deep. I spy a box or two and stand guard for an hour and fifteen minutes. Everyone else does, too, and we will tell you which box(es) is (are) ours. If you want something out of my box that I don’t want, fine – I’ll give it to you after I grab my box. Many of us crouch into starting positions as though we are about to run a marathon, waiting for the whistle to blow. This, folks, is not an ordinary sidewalk sale – this is a relay, in every sense of the word. You may win or lose your box. I’ve had boxes grabbed out from under me because some people don’t like to play by the rules. Normally most everyone is nice, but there is always one or two that likes to ruin it for everyone. There you have it! A box full of healthy goodness for diiirt cheap. 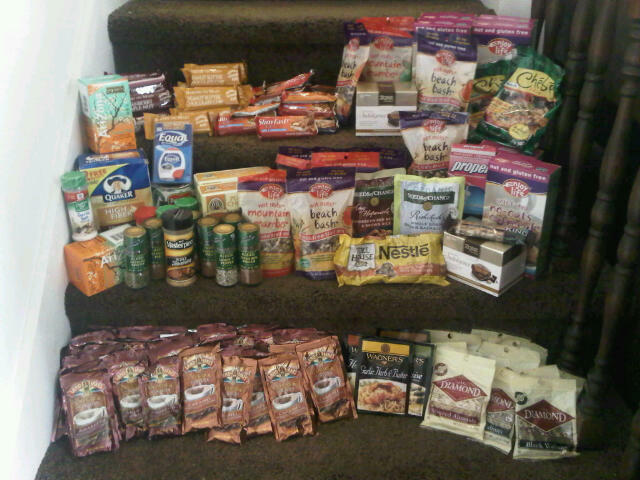 See if you can find out if there is a store in your area that does something like this – it is so worth it! For those of you close to me, I will let you know where to find this one. Get a wrap. The spicy wrap is 110 calories versus 300 calories for the chargrilled sandwich. It also has 8g of fiber per wrap, versus 3g in the sandwich. That’s MUCH healthier than Mickey D’s! I eat it with their fruit cup. Yummy, yummy sweeties! Yes, I am an advocate for enjoying desserts even when you’re on a healthy living lifestyle. In moderation, well prepared desserts and sweets (not processed) can be real treats. Today we discovered two new sweet treats together. Every other Saturday, Noah is weekending with his mother and Scott and I have the house to ourselves. Two Saturdays back, that Saturday resulted in our delish pumpkin pie. This Saturday, we intentionally made a great dessert and stumbled upon another one. The creations? 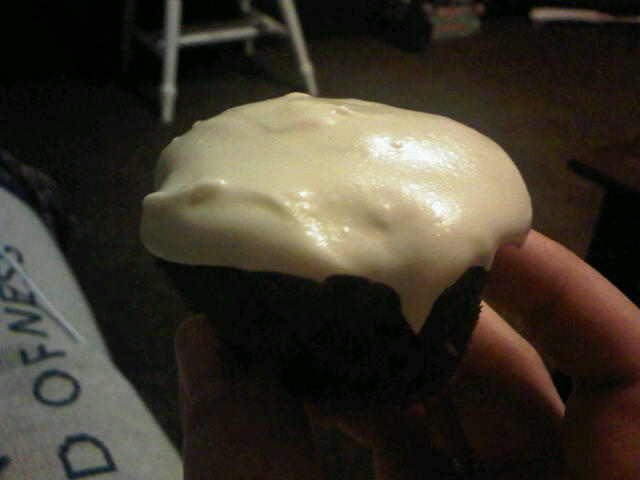 Cinnamon butter gnocchi and coffee chocolate cupcakes with Bailey’s Irish Cream frosting. Prepare gnocchi per directions on the package. Melt butter in medium skillet over medium heat with the cinnamon stick. As the butter melts, add 2 tbsp ground cinnamon and 2 tbsp sugar. Stir together until butter is completely melted. Remove cinnamon stick and set aside. Drain prepared gnocchi into colander and add gnocchi to the sauce. Toss gnocchi in sauce well. Serve immediately, adding a sprinkle of ground cinnamon on top of the servings. Here’s the thing about this dish. When we saw it, and read the reviews, it looked like it would work for a meal, as many had eaten it this way. When we tasted it, though, all we could think of was dessert. I could see it being eaten for breakfast maybe, but it’s too sweet and rich to be eaten as a meal for supper. We ended up eating something else. Also, I liked this a whole lot more than Scott did. It just wasn’t his cup of tea, but I really like it. 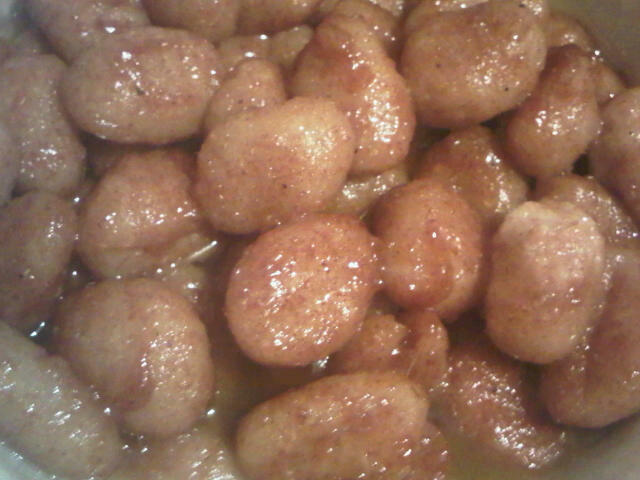 It reminds me of mini cinnamon rolls! The sauce is rich and pairs well with the texture of the gnocchi. In bowl, dissolve baking soda in room temperature buttermilk. In saucepan, melt butter and cocoa together over low heat. When smooth, add coffee. In another bowl, mix sugar, flour, and salt. Add cocoa mixture and egg and mix slowly. Add buttermilk mixture and vanilla and beat until smooth. Bake at 350 for 20 minutes, or until poke testing utensil of your choice comes out clean (we use skewers). 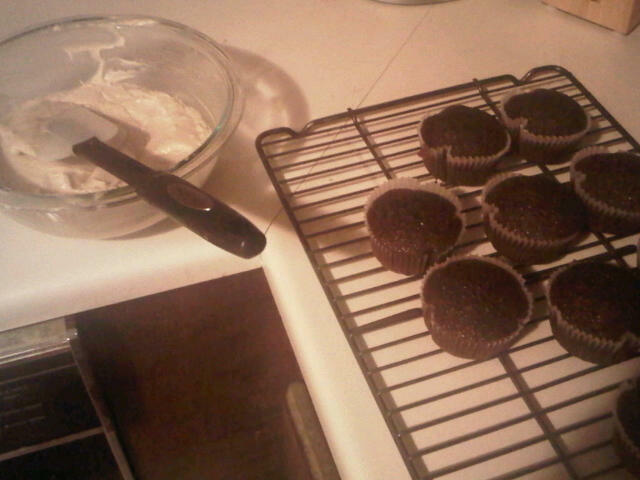 For the icing, mix together all ingredients and spread on cupcakes. Most know that coffee goes well with Bailey’s. Well, it’s true even in cupcake form! These are so decadent that I had to have another one. Not as in I just wanted another one – I mean my taste buds were begging me and were going to cry if I didn’t have another one. They just weren’t finished yet. I try not to give such gloriously glowing reviews in fear of someone not believing me, but if you just try this cupcake, you will become a believer. It is that good. If you have a bake off or covered dish coming up, these will be a smashing success. They epitomize all that is wonderful about cupcakes. So there you have it. I had a sweet Saturday making sweeties with my sweetie. It was an awesome day, and I am truly blessed to have such a wonderful hubby. Which of these two sweets do you want to try? I really, really, really wish that Fall would make its appearance here in the south!!! We had one week of lower temperatures, but today it was 87 degrees. It’s October!!! The leaves should be changing, and I should be able to wear the long sleeved shirts that I recently pulled out of our storage closet. I can’t, though, and that’s kind of depressing. Fall is my favorite time of the year. The leaves aren’t even changing yet! I’ve seen flocks of birds fly south, but I think that has more to do with how the Earth revolves than it does the temperatures. I’m ready for my fall. Even though Fall hasn’t officially shown up here in the Carolinas, I have had some fall indulgences since the calendar told me Fall has begun. I wrote about pumpkin pie that Scott and I made in the dead of night last week. We also have found honeycrisp apples! 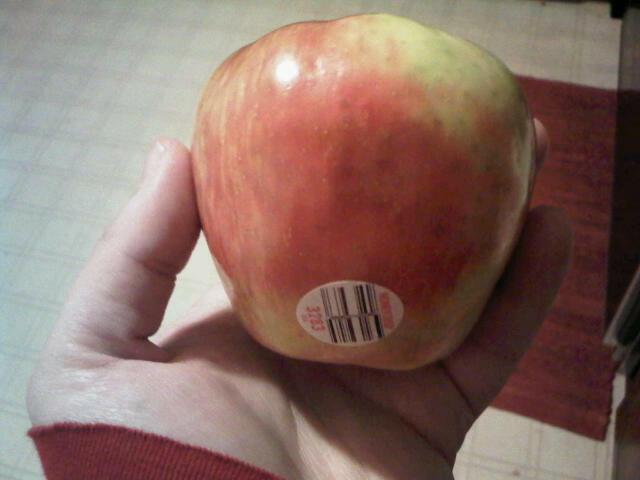 Honeycrisp apples are, by far, my apple of choice. I love how crisp they are, and how the apple juice flows with every bite you take. It’s not very tart – it’s quite sugary compared to some other apples. I looked all over for honeycrisp apples when we went to the farmer’s market a few Saturdays ago and no one had them yet. Their peak harvest month is Ocober. Scott found them at the grocery store last week and brough home some for me! Excitedness. He noted that their price is about a dollar more than the other apples, but that’s due to it only being available for a few weeks in the Fall, while other apples are available most of the season. 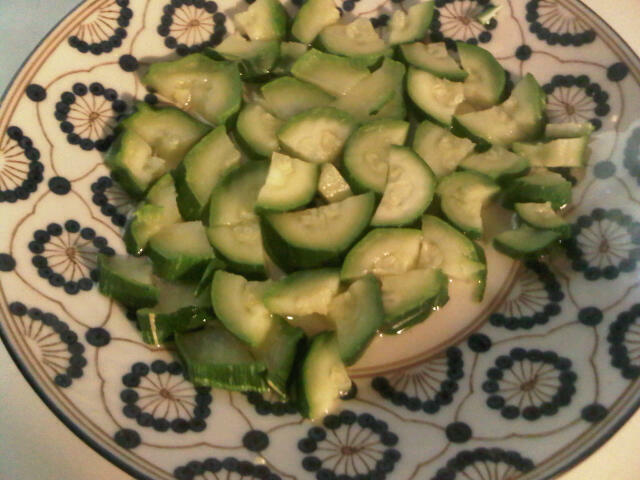 I also tried something different last week – I was in the mood for zucchini, but didn’t want to wait on water to boil and all that, so I tried steaming them in the microwave. I didn’t use any instructions, just chopped up the zucchini and drizzled with a teeny bit of water, then put it in for 45 seconds. On a final note, I need to mention something about greek yogurt. I have plugged Chobani yogurt in the past, and that’s what I’m about to do again. I love their yogurt! It’s so thick, creamy, and rich, and has much less fat than other yogurt, and absolutely zero additives. Most fat free brand name yogurts (store brand, too) contain high fructose corn syrup because they need to cover the extreme tanginess of the yogurt. Greek yogurt doesn’t need any because of how they strain their yogurt. They use real fruit, pectin, and cane sugar. My reason for bringing up greek yogurt again is this: please be sure you stir it up. Most greek yogurt is fruit on the bottom. Scratch that, the fruit, cane sugar, and pectin is on the bottom, unlike other yogurts where the HFCS is in the yogurt. Have fun stirring up your greek yogurt! You’ll be glad you did. It means the difference between sour cream and pudding. Plain greek yogurt can be used as sour cream, and the yogurt on top of the fruit mixture is plain greek yogurt. It will taste that way unless you stir it up first. 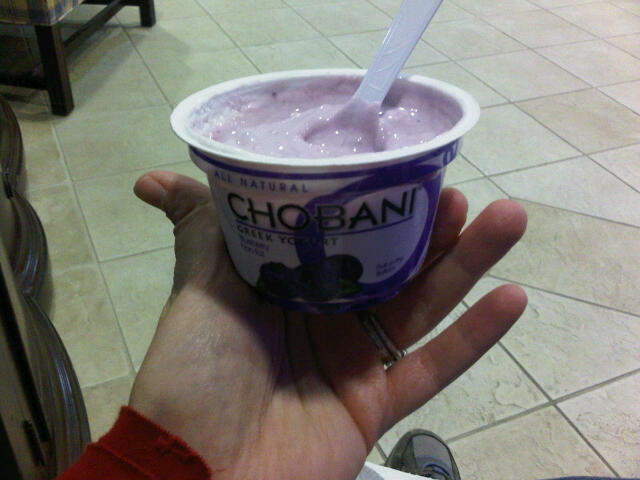 I’ve had some people tell me they were not happy with the blah flavor of the yogurt, and everything was at the bottom. So be sure to stir your greek yogurt! What’s your favorite kind of yogurt? My sister is in Spain!